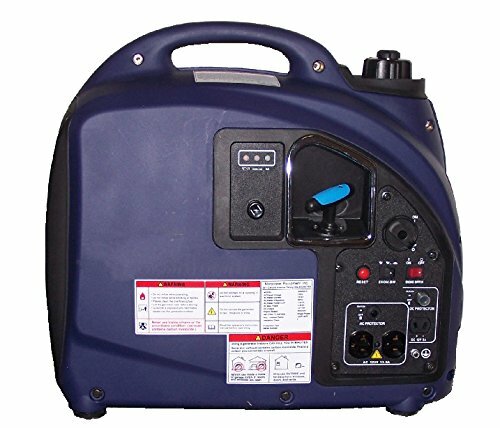 It can be a little confusing to understand the difference between a standard generator and an inverter generator. A standard generator uses an external source of energy such as diesel, propane, or gasoline to spin an alternator that subsequently produces energy. A standard generator needs to spin at around 3,600 RPM in order to produce 120 volts of electricity at 60 Hertz. Unfortunately, if the RPM of the generator fluctuates, this will have a negative impact on the quality and power of the electricity it generates. A standard inverter is a device that converts one source of electrical energy into another. Typically, a standard inverter will be connected to a source of direct current (DC) electrical energy like a solar panel or battery in order to invert the DC current into an alternating current (AC), the type of current used by homes and offices. An inverter generator is the masterful result of combining these two technologies using magnets and advances in electronic circuitry. Most inverter generators begin by creating AC electricity like a standard generator but then convert it first into direct current (DC) before inverting it back into AC power. The benefits of using an inverter generator include the fact that the electrical current produced is stable, smooth, and free of fluctuations in voltage and frequency. Because of the advanced technology inside of an inverter generator, the size and weight of the unit is usually much less than that of a standard generator. Instead of having to rely on outsized, heavy units to reliably generate electricity, today’s inverter generators are often as light as 30 pounds and small enough to easily fit in a boat, car, or recreational vehicle. Best of all, inverter generators rely on breakthroughs in sound-dampening technology, mufflers, and quieter engines to produce far less noise than standard generators, which can be as loud as 75 decibels, the same sound range that includes jet engines and chainsaws. Most of the leading models of inverter generators will list both their starting and running wattage. The running wattage refers to the amount of electrical energy produced by the inverter generator during the majority of its operation. The starting watts specification refers amount of power it can produce during surge needs such as when the inverter generator is first turned on. Remember that motor-driven appliances like refrigerators will require a special surge of energy when they first begin to operate. By listing all of the combined wattages of the devices and appliances you plan on being operational when the inverter generator is turned on, you can accurately calculate the amount of starting watts that you’ll need your inverter generator to be able to produce. In some cases, you may be in the market for an inverter generator that can be permanently installed at a given location. But whether you plan on using your inverter generator in a car or on a boat, RV, or other form of transportation, it is important to pay attention to the overall weight and size of the inverter generator. Breakthroughs in electricity generation mean that powerful inverter generators now exist that are small and lightweight enough to be easily transported from one location to another. CARB is an acronym that stands for the California Air Resources Board. Since 1967, California has imposed strict rules on devices, appliances, and vehicles that could potentially cause problems for air quality. CARB standards are much more stringent than federal guidelines, so a inverter generator that meets CARB standards is meeting or exceeding all national rules and standards for air quality. With a bright yellow and black design, the Champion 75531i delivers up to 3,100 starting watts and 2,800 running watts yet produces only 58 decibels of noise. The Champion 75531i can reliably deliver up to eight hours of energy with a full tank of gasoline. The special 171 cubic centimeter Champion motor delivers a steady flow of clean electricity ideal for sensitive electronics. The Champion 75531i comes with one 120-volt 30-amp RV DC outlet, two 120-volt 20-amp household outlets, and a 12-volt DC outlet. The Champion 75531i can also be used in economy mode for even quieter and more fuel-efficient operation. Featuring an elegant neon green and black design, the Ryobi RYI2200 delivers up to 2,200 starting watts and 1,800 running watts of reliable electricity. Using a 106 cubic centimeter four-cycle engine, the Ryobi RYI2200 can deliver electricity via one 12-volt DC outlet and two 120-volt AC outlets. The Ryobi RYI2200 can also be daisy chained to another Ryobi RYI2200 for twice the power. 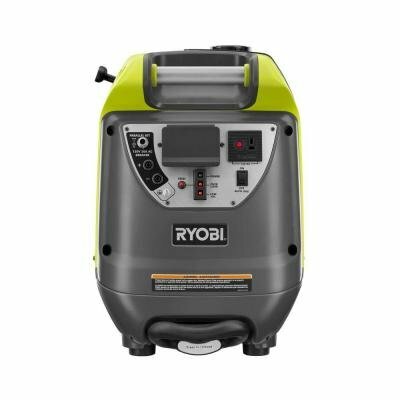 Designed to operate “quieter than a conversation”, the Ryobi RYI2200 is small and portable enough to be used in a vehicle, at a campsite, or anywhere else that you need a current of smooth and reliable electricity. 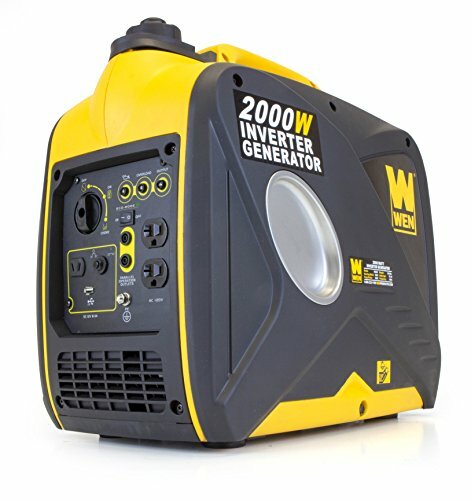 With an easy-to-find bright yellow and gray design, the WEN 56200i is a CARB-compliant inverter generator delivering a steady flow of 2,000 starting watts or 1,600 running watts. Producing the same amount of noise as a standard conversation, the WEN 56200i uses an EPA III compliant 79.7 cubic centimeter four-stroke engine to deliver electricity via one 12-volt DC outlet, one five-volt USB port, or two grounded 120-volt AC outlets. Ideal for power outages, job sites, campgrounds, and anywhere else that you need an instant source of smooth and reliable electricity, the WEN 56200i weighs just 48 pounds and measures 18 by 11 by 18 inches in size. From one of the biggest names in generator technology, the Honda EU2000I is designed to run as quietly as 53 decibels while producing up to 2000 starting watts or 1,600 running watts. 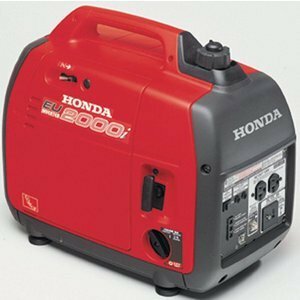 The Honda EU2000I produces a steady current of electricity safe enough for use with laptops and mobile phones via the single 12-volt DC outlet and two 120-volt AC outlets. The Honda EU2000I weighs just 46 pounds when empty and comes with a 0.95-gallon fuel tank to produce electricity for up to eight hours before needing to be refilled. 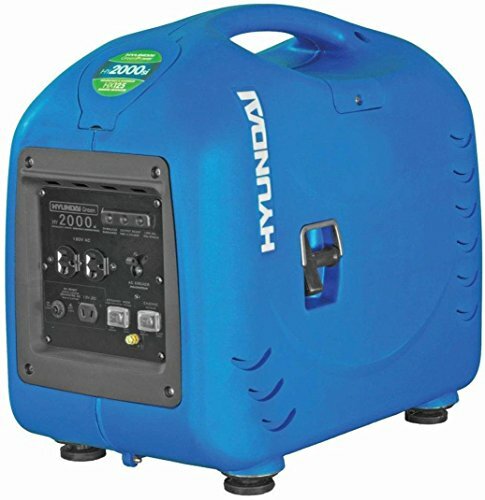 With a lovely blue design, the Hyundai HY2000si uses a highly efficient four-stroke 3.8 horsepower motor to deliver 2,200 starting watts and 2,000 running watts of reliable electricity safe enough to be used with sensitive gadgets like smart phones, tablets, and laptops. Fully compliant with EPA and CARB standards, the Hyundai HY2000si uses a 1.2-gallon fuel tank to provide up to nine continuous hours of electricity via one 12-volt DC outlet and two 120-volt AC outlets. The Hyundai HY2000si comes with car battery charging cables, and operates at just 64 decibels under maximum load. The Hyundai HY2000si weighs just 32 kilograms when empty and comes with an ergonomic handle for enhanced portability. 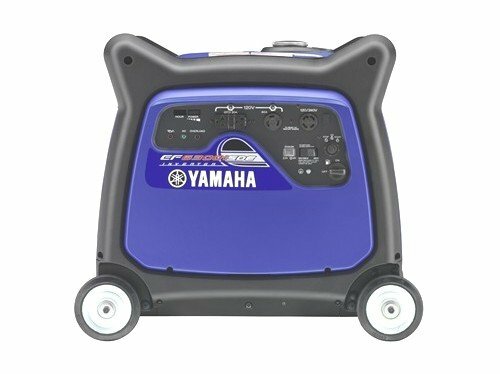 Featuring a stylish purple and black design with built-in wheels for ease in transportation, the Yamaha EF6300iSDE is one of the most powerful portable inverter generators on the market. The Yamaha EF6300iSDE can produce up to 6,300 starting watts and 5,500 running watts using the special pure sine wave inverter system. The Yamaha EF6300iSDE comes with a smart throttle to automatically adjust engine speed to produce precisely the right amount of power. The Yamaha EF6300iSDE comes with an included wireless remote control and two 120-volt and two 240-volt AC outlets. The Yamaha EF6300iSDE is compliant with all CARB and EPA regulations. This compact inverter generator from MSD Ignition produces just 54 decibels under maximum load, making it one of the quietest models on the market. The MSD Ignition inverter generator weighs just 31 pounds when empty and comes with a throttle switch to easily adjust the motor speed to produce the desired amount of electricity. 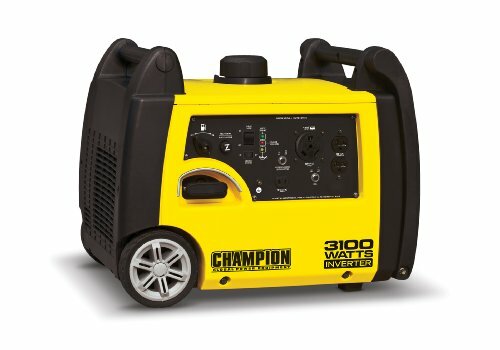 Able to generate up to 1,000 starting watts, the MSD Ignition inverter generator is ideal for camping, RVs, construction sites, tailgating parties, and anywhere that you need a reliable source of clean energy suitable for televisions, electronic gear, and computers. From one of the most recognized names in power production, the Energizer eZV2800 uses a powerful 3.8 horsepower 125 cubic centimeter motor to quietly and efficiently produce up to 2,800 starting watts and 2,600 running watts of reliable energy. 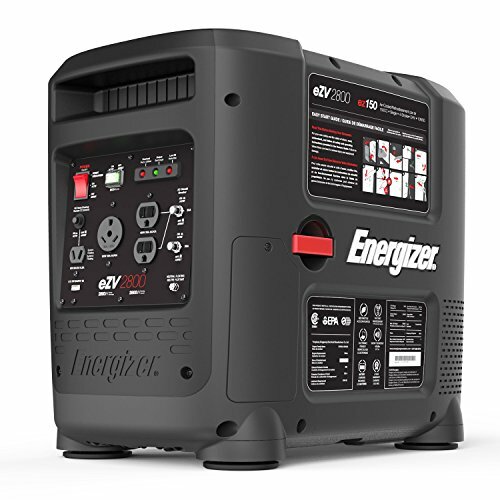 The Energizer eZV2800 is designed to operate for up to six hours at 75% load and comes equipped with two 120-volt AC 20-amp (ideal for household appliances), one 120-volt 30-amp (ideal for RVs), one 12-volt DC, and one 5-volt USB outlets. The Energizer eZV2800 is fully EPA and CARB compliant, and features an easy-to-use one button electric starter button. Special copper-wound heads on the Powerhorse inverter generator ensure that the unit will never overheat even during continuous use. The Powerhorse inverter generator comes with cables to allow it to be daisy chained to other inverter generators for increased power production. It’s a CARB and EPA-compliant device producing up to 2,000 starting watts or 1,600 running watts of fluctuation-free electricity. It produces just 52 decibels of noise when operating and comes with a removable side panel to easily add oil when needed. 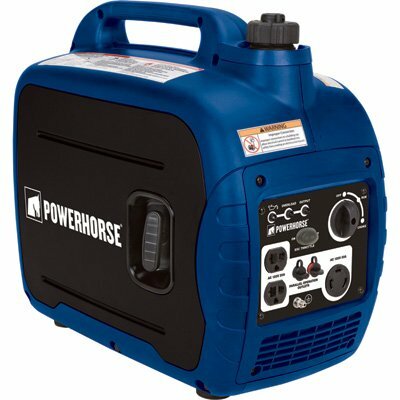 When empty, the Powerhorse inverter generator weighs 52.2 pounds and measures 20.7 by 19.4 by 12.1 inches in size. 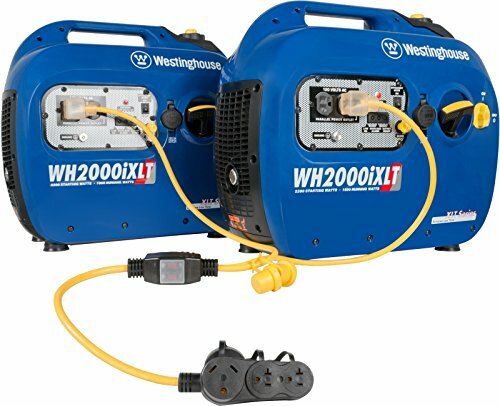 Featuring a bright blue design, the Westinghouse WH2000iXLT produces just 59 decibels under 50% load and weighs just 43 pounds when empty, making it the perfect portable choice for vehicles, boats, campgrounds, and job sites. The Westinghouse WH2000iXLT can deliver up to 13 hours of continuous 2,200 starting watts or 1,800 running watts using a 1.3-gallon gas tank. The Westinghouse WH2000iXLT is designed to be connected to other Westinghouse inverter generators for increasing power production. The Westinghouse WH2000iXLT is both EPA and CARB compliant and comes with a high-efficiency mode to minimize sound, fuel use, and wear and tear on the motor. The Westinghouse WH2000iXLT comes with two 120-volt standard three-prong AC current outlets.